At the end of the 80’s, many bands of what we called Glam Metal had great success on the radio and on MTV. But since the coming of the Grunge Rock and Alternative Rock invasion in the first years of the 90’s, this musical genre was blown away. Only in the last 5-6 years Glam Metal came back from the dead with full strength. New and old bands are living with each other without problems. 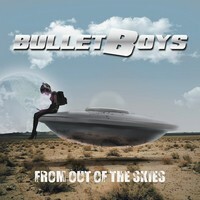 A veteran as BULLETBOYS deserves a lot of respect from us all, especially now that they’re releasing a new album, called “From out of the Skies”. Their musical work is based in a Glam Metal/Hard Rock with a nasty and heavy approach, like we could say that they had the same vision of names as MOTLEY CRUE and TESLA, but with some Groove influences that can be heard throughout the album. But don’t get the wrong idea: their melodies and choruses are hooking enough to make you be tied to their music. Yes, they are alive and kicking! The sound quality of “From out of the Skies” is really very good. It has that heavy and abrasive form of sound that modern Glam/Hard Rock bands uses, besides the band don’t deny their melodic charm. The melodies flow pretty easy due the sound quality, so be ready to be hooked! To be honest, BULLETBOYS was experiencing a crescendo of fame back at the end of the 80’s, but as the new tendencies came and crushed their musical genre into underground, they were kicked off paradise. But their talent seems to had some improvements, and songs as the heavy Glam Rock shown on “Apocalypto”, the classic Hard/Sleazy energy of “D-Evil” (very good guitars and some Groove can be heard), the wonderful melodies of “Hi Fi Drive By”, the acoustic ballad “Losing End”, the heavy and charming guitars on the accessible song called “Get Ready”, the powerful and grooved “Sucker Punch” (fine vocals and backing vocals), and the hypnotic harmonies presented on “Once Upon a Crime”. Let these noisy boys play heavy outside, and let your hearts be won by “From out of the Skies”.